Rip DVD audio on Mac, Mac DVD Audio Ripper for Mac. iMacsoft DVD Audio Ripper for Mac is the best Mac DVD Audio Ripper software, which can rip audio from DVD for Mac OS users. It can help you rip movie DVDs audio and convert the audio files to the target format you want. This powerful Mac DVD Audio Ripper can rip audio from any DVD to MP3, MP2, M4A, WAV, WMA, AAC, AC3, OGG, RA, etc. for different MP3 players and audio players, such as iPod classic, iPod nano, iPod touch, iPhone, Mobile Phone, PSP, iRiver, Zune with very high output quality. Besides ripping audio from DVD on Mac, the Mac DVD Audio Ripper allows you to customize file size, split output file, select audio track and subtitle, and adjust video and audio parameters like bit rate, sample rate, resolution, frame rate, etc. Moreover, you can edit the output audio files to enrich its info, such as audio, subtitle, angle, album and title. Batch process and multithreading conversion can make you have an easy and fast way to get what you need. 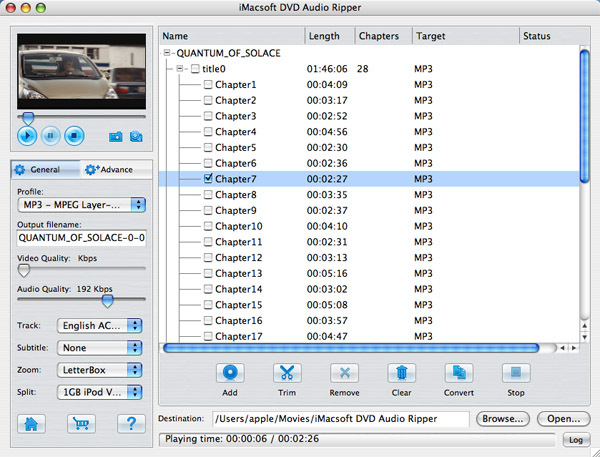 Try iMacsoft DVD Audio Ripper for Mac free now and enjoy your favorite DVD music and DVD audio clips on your audio players! You will find an easy way to get audio/music you want from movie DVD with this DVD Audio Ripper! Supporting multithreading and batch conversion, the DVD Audio Ripper for Mac offers conversion speeds greater than any other Mac DVD Audio Ripper product. The faster your system is, the faster you can convert videos to audio. How to rip movie DVD to MP3 audio files on Mac? How to rip DVD to WAV files? How to convert movie DVD to WMA audio files on Mac? How to rip movie DVD to AC3 audio files? How to extract movie DVD to OGG files on Mac? How to rip movie DVD to audio files on Mac?